A five-year-old girl suddenly appears on the doorstep of a well-to-do Hamburg family. The members of the multi-generational, white household react differently to the arrival of Toxi, who is black, the daughter of an African-American G.I. and a white German woman who has died. Eventually Toxi works her way into the hearts of this German family, but then her father returns, hoping to take Toxi back to America with him. At the time of the film’s release in 1952, there were between 3,000 and 5,000 children of Allied paternity born since WWII living in West Germany. 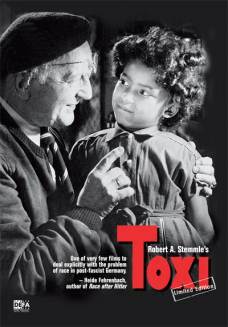 Toxi was the first feature-length film to explore the subject of “black occupation children” in postwar Germany and premiered when the first generation of these children began entering German schools, creating a public awareness of this situation. Robert A. Stemmle, one of the most popular West German directors and known for his unique blend of social realism and melodrama, brought together an exceptionally renowned set of classic German actors with diverse experiences of the Nazi era, including Paul Bildt, Johanna Hofer and Elisabeth Flickenschildt.